This is a more intimate look at this cascade previously shared on August 15. Aside from a different framing, I have refined the processing a bit more, pulling the closer cascade out from the background and adding a bit more emphasis to the green reflection at the top. The past two weeks haven’t seen much rain here so I have not looked for water images. But we received the remnants of Gordon this week along with a lot of other bits of precipitation that are dotting the country so this weekend might be good for that. I don’t know whether Florence will be coming our way, but it sounds like the southeast, especially the Carolinas, are going to get hit hard and over a few days possibly. I hope it weakens considerably once it makes landfall so they do not receive much damage. This entry was posted in Intimate Landscape, Landscape, Nature Photography, Water, Waterfalls, Western Massachusetts, Western Massachusetts Waterfalls and Cascades and tagged Buffam Brook, Buffam Road, cascades, intimate landscape, landscape, Massachusetts, New England, New England Waterfalls, Pelham, water, waterfall, western massachusetts. Bookmark the permalink. As I mentioned earlier, we’re well past the irritated stage with rain, and moving toward frank anger. It just won’t stop. Lighting a candle rather than cursing the darkness works pretty well, but I’m not quite sure that to do about all this water. I’ll be glad to be able to work again, not to mention being out and about with the camera. Two weeks is long enough. You did well with your cascade, though. This one’s really pretty, and I especially like the green swirls at the top. The glassiness is especially appealing. Depending on the type of rain you’ve been getting, I just bought an umbrella and tripod clamp that might help you make a few rainy day images. I haven’t actually used it yet, but I had a flimsier one previously that sort of worked. This seems more sturdy. 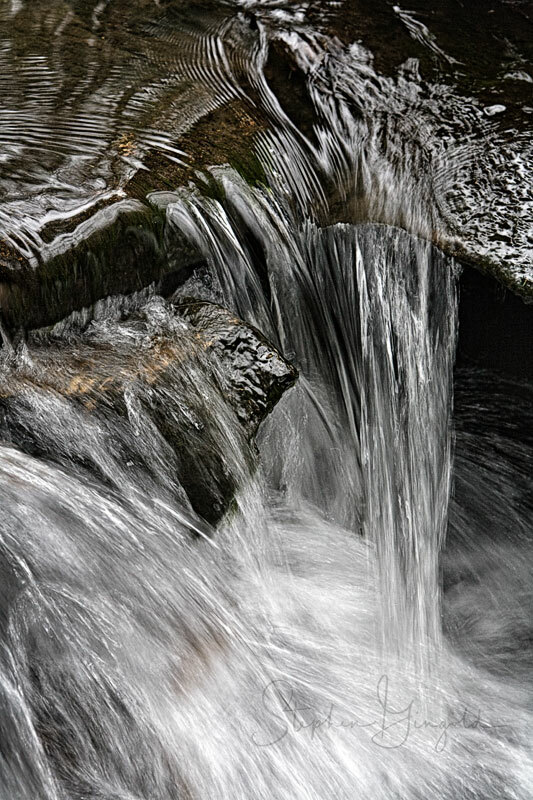 I shot this cascade about 10 or 12 years ago from the opposite side and it had a nice glassy quality then too. I’ll see if I can post it below. Oh, my. That’s beautiful. The water has the clarity of fine crystal. Did I mention it’s beautiful? Yes, and you may again if you wish. 🙂 It’s an inconspicuous little spot. Right next to the road, but I don’t think many people pay it much mind. It is a bit cumbersome for some folks and you’ve been making fine images without one. But for some things it helps raise the quality level so worthwhile. 99+% of my images are made on the tripod. When and if you get around to buying one, get a good one. Cheap ones don’t offer much in the way of sturdiness which can make a huge difference. I’ve never been one for cheap. Mama taught me the meaning of ‘false economy’ early.